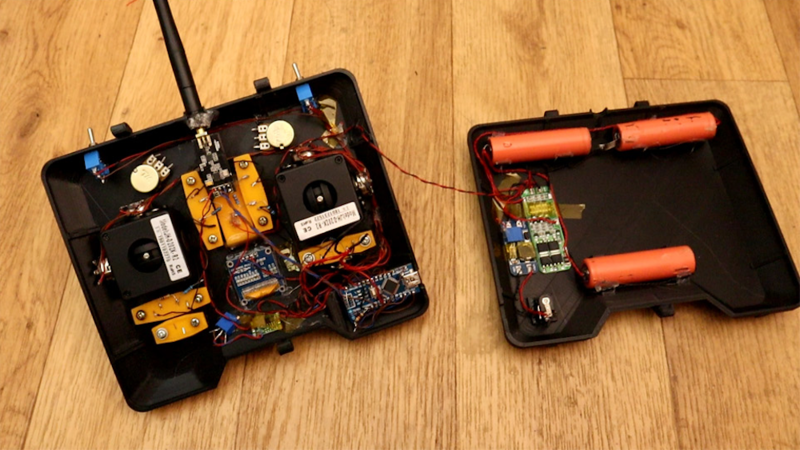 If you’ve ever considered constructing your own wireless RC transmitter, be sure to check out this build by Electronoobs. 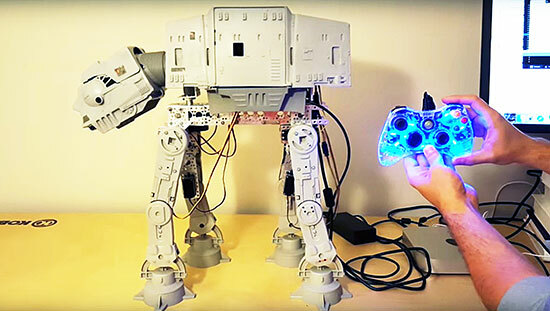 The device uses an nRF24L01+ module to transmit inputs from a pair of joysticks and toggle switches, along with an Arduino Nano for interface and control. 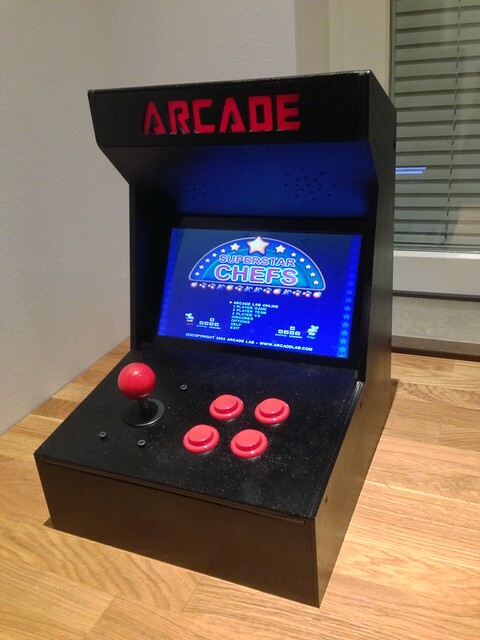 What sets this project apart from his previous versions, however, is the very nice 3D-printed enclosure for the electronics and a pair of high-quality joysticks that allow for precise input. Additionally, Electronoobs’ latest design features tuning buttons to properly center the sticks, and an OLED display to show the actual input value that it’s sending to the receiver (a simple Nano/nRF24L01+ setup for demo purposes). Code and more details can be found in Electronoobs’ tutorial. 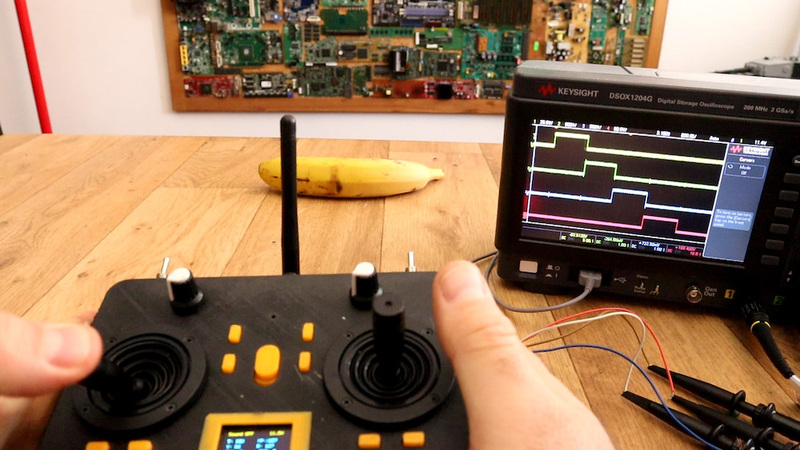 YouTuber “Insert Controller Here” has been creating gaming controllers out of a variety of objects, like bananas, mayonnaise, and meat. 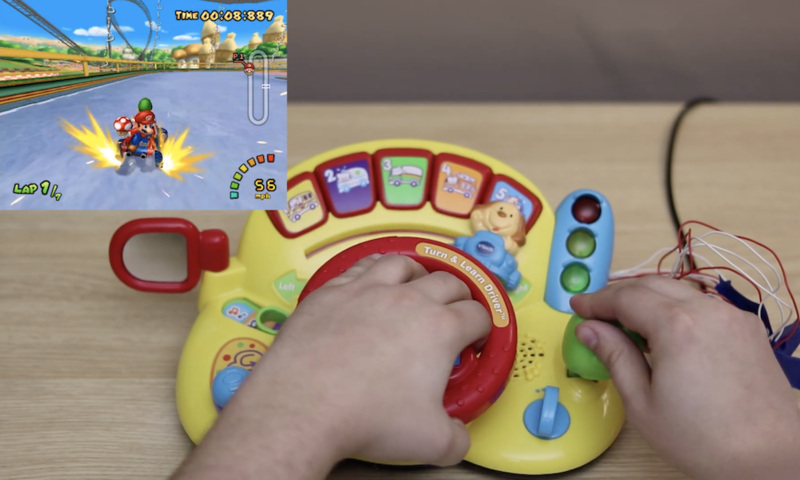 For his latest iteration, the YouTuber decided to convert a VTech Turn and Learn Driver into—what else?—a Mario Kart: Double Dash steering console. As seen in the video below, the build consists of disassembling the toy, then soldering wires to the correct points to recreate steering wheel input, braking, and throttle. An Arduino Leonardo is used for the gaming interface, allowing Mario and Luigi to make it around the track by turning the wheel and applying brakes, while the accelerator is simply “shifted” into place. Hello, Operator! is the gaming experience that puts you in the role of an 1920's phone operator. The controller is a vintage switchboard. The post Play Like a 1920’s Phone Operator with This Switchboard Gaming Interface appeared first on Make: DIY Projects and Ideas for Makers. 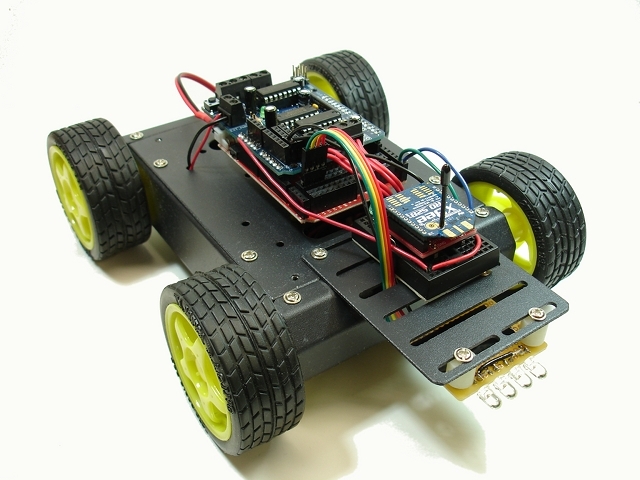 In his blog, Michael describes a nice 4WD robot he realized by means of an arduino-compatible board, a motor shield and a couple of XBee radios, which have been used to implement a simple and effective remote control. Actually, the remote is made up of a standard breadboard equipped with a joystick, a couple of buttons (that can turn the robot in a Kitt-like vehicle!) and the XBee radio. 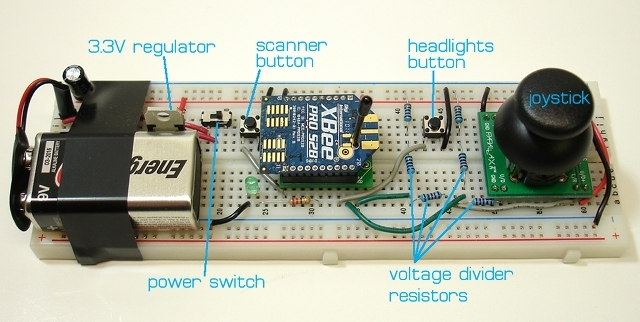 One interesting feature of this project is that the remote controller is fairly simple and has been designed to work with just the XBee radio board, instead of requiring an additional MCU. 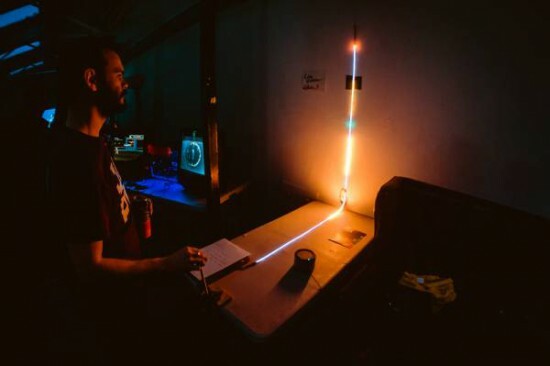 Amanda Ghassaei has published on her website an interesting project: the Glitchbox. The glitchbox is an electronic instrument used for live audio sequencing. Each of its nine buttons is linked to an audio file stored in its memory, new audio files may be loaded onto the instrument via USB. A switch on top allows the user to play, record, and loop a sequence of audio. Once recorded, additional audio may be recorded and automatically looped on top of an existing sequence. Old sequences can be cleared from the instrument’s memory and replaced with new sequences live. Two knobs on top of the instrument control volume and tempo, and a second switch mutes and unmutes recorded sequences. There is also a detailed instructable with all the information needed.